How do you describe your work, Paula? 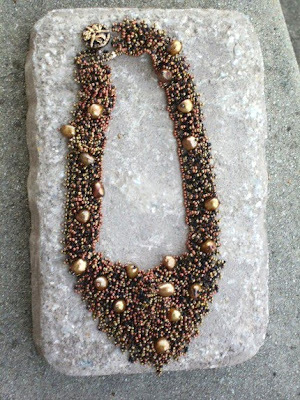 I have always been inspired by vintage and antique jewelry. When I was a teenager, I loved shopping for 1928 Jewelry Company pieces and I think those long-loved styles come into play when I am creating jewelry today. 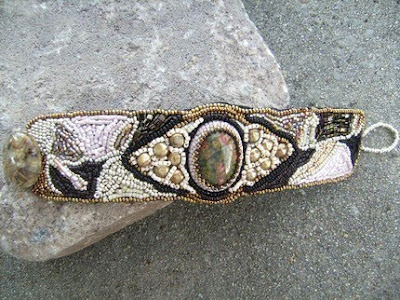 In my Baroque embroidered bracelet, that definitely rises to the top! My work is also influenced by the colors of nature, air, sky, mountains and ocean. I chose Artful Diva Designs as my business name to not be limited to jewelry, but to encompass anything that flows out of my imagination. Most of the time, it's a "go with the flow" process. I am not a big planner. Occasionally I will do a rough sketch just to help the ideas form. I usually focus on one element, perhaps a cabochon, and start gathering the supporting players. I spread them out on my desk, and let them play with each other for a while. When I think they are all getting along well, I begin. I started embroidering in my teen years. Remember when we all embroidered our jeans? That seemed to translate so easily into embroidering with beads. I learned much of what I know from books and have never taken a beading class. Trial and error is a good teacher. Yes, Fireline! It is so useful in woven pieces! 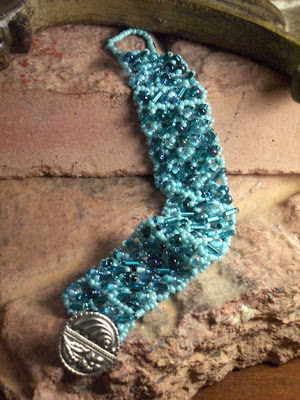 I am always adding to my seed bead collection, too. It's inspiring to have a lot of colors and textures to choose from. Knowing that if I push through the roadblock, something good will come out of it! Sometimes putting it away for a few days and coming back to a project that was not working gives me a fresh perspective and new ideas to incorporate as I move forward. Don't give up! 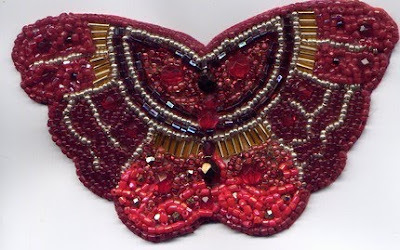 I've cut up miles of bead work on the quest to perfect what I have learned so far, so don't hesitate to start over. And, don't be too critical of your own work! What are you looking forward to exploring in the future? I am intrigued by painted fabric, and that's on my list! I've seen some beautiful painted silks and think it would be fun to incorporate beading into scarves and other wearables. My husband and I love to cook together, and it's hard to say-but homemade Moravian chicken pie is high up there! Creme brulee and tiramisu are my favorite desserts-love the creamy factor! I work as a cruise travel consultant and it's very fulfilling to send clients on wonderful vacations. I teach occasionally at Ding's Jewelry Design Studio in Winston-Salem. I also enjoy reading, playing the piano, listening to music and of course, cruising when I can! Absolutely gorgeous work - really love all the pieces. Great job! Great profile - love Paula's work - all the pieces pictured are amazing. 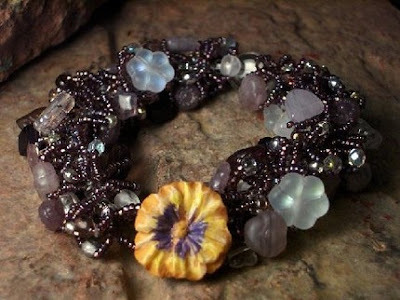 I love learning about fellow bead artists. enjoyed reading your interview and love the pieces, absolutely beautiful! thanks so much, ladies! Big thanks to Cyndi for featuring me! "Trial and error is a good teacher." I like that. The pieces pictured are beautiful. What a gift for design Paula has!